Waring and Siegel’s “The only spending rule article you’ll ever need” proposes a dynamic spending rule based on ARVA or Annually Recalculated Virtual Annuity”. ARVA effectively recalculates each year the income that you would get if you could buy a fairly priced level payment fixed term real annuity based on current: (1) real risk-free rates, (2) a conservative estimate of how long you’ll need the income, and (3) the available assets. With a risky portfolio and ARVA, you effectively would be recalculating virtual annuity each year based on the then current value of your risky portfolio. So you got to be able to live your life with some built-in spending flexibility. The article also has a good discussion about the meaning of risk in terms of income rather than asset variability. I have added a spreadsheet illustrating the maximum (%) withdrawal rates for a given real risk-free rate as a function of age for the proposed approach; the spreadsheet also includes a way to address maximum portfolio risk (stock allocation) consideration by factoring in fixed and discretionary expenses, and your “worst case” stock market drop assumptions. The risky portfolio approach might still be combined with longevity insurance if you’re unduly concerned about longevity considerations, which this article deals with by using a lifespan adjusted life-expectancy for planning horizon. The paper states the obvious but many people will no doubt be surprised: “don’t expect a fixed income from risky investments”. So if you don’t want or can’t afford to pay for an inflation indexed annuity (in the U.S.) or use a ladder of TIPS which allow you to cover a 30 year horizon (or RRBs in Canada if you can find them), but want to use a (more risky) portfolio of stocks and bonds then you should forget about “settling on a spending rate when you first retire and then expect to stick with it for the rest of your retirement”. I recommend this paper for your reading pleasure and to explore how the proposed strategy may be applicable to your situation. For many years the gold standard of decumulation strategies was the “old 4% rule” (take 4% of your initial assets for year one, then increase that dollar value by inflation each year to maintain a constant real standard of living). Unfortunately as expected stock market returns are now lower and volatility higher, the “old 4% rule” made less and less sense, as it lacks any feedback to correct for changes in assets as a result of adverse market returns thus creating a risk of running out of money before death, particularly with the increasing time people spend in retirement. Immediate real annuities, if you can get them, solve some of the problems but at a very high price and introduce the problem of insurance company counterparty risk. In an earlier paper by Sexauer and Siegel which I discussed in a blog post entitled Two very different decumulation strategies , for highly risk-averse investors they proposed an alternative to immediate annuities which is essentially comprised of a TIPS ladder to age 85 delivering an inflation indexed income stream, combined with a longevity insurance to cover the residual longevity risk beyond age 85 delivering an unindexed income stream at the same level as achieved at age 85. The “proportional 4% rule” (where effectively each year is the 1st year of applying the “old 4% rule”, i.e. take each year 4% of your remaining assets) largely solves some of the problems with the “old 4% rule” (like running out of money before death) but creates a new one: a higher income volatility that you must live with (though can be mitigated by the floor and ceiling refinement). Another problem with this approach that it makes no systematic allowance for the opportunity to safely spend each year more than 4% of available assets as one ages and has fewer (but still unknown) remaining years of retirement to be funded. This is where Waring and Siegel show how annuity principles (without buying annuities) and lifespan modified life-expectancies can be used to determine the maximum permissible withdrawal each year from a risk free or risky portfolio, without the risk of running out of money, yet aiming for a trajectory of increasing income through much of one’s retirement. In “The only spending rule article you’ll ever need” Waring and Siegel go one step further and look at how one might approach the decumulation problem for those who don’t want to buy an immediate or deferred annuity (longevity insurance) because “they are concerned about insurance company counterparty risk and may also want higher expected returns from risky assets”. What they are proposing is a virtual “periodic re-annuitization” which they call ARVA or Annually Recalculated Virtual Annuity. Each year the maximum an investor can afford to spend is the equivalent of what a real inflation indexed annuity would deliver starting that year; implemented as a riskless strategy with laddered TIPS (as described in the earlier Sexauer and Siegel paper), the payout will be the same each year (but of course with rates locked in for the duration of the ladder at the initial levels). However when risky assets are part of the portfolio, the year end assets will vary (with the risky portfolio’s return) and the virtual annuity payment will be recalculated each year using the readily available annuity formula in Excel and the then operative value of the necessary parameters: asset value, real risk-free bond rates, safe number of remaining years of required income. This is a fully deterministic calculation, and the authors note that this is the only way to meter spending so that there is no danger of running out” of money when “asset values and interest rates fluctuate”. The bottom line is that there is no riskless way of fixed spending rate from a risky portfolio. Their generalized spending rule for riskless and risky investors as: “Spending in current period should not exceed the payout that would have occurred in the same period if the investor had purchased, at the beginning of the period, a fairly priced level-payment real fixed term annuity with a term equal to the investor’s consumption horizon”. -available assets= exactly as name implies “available assets” for virtual annuitization, i.e. the size of your portfolio from which you are spending (e.g. for the example in the blue box of the spreadsheet, the real asset and real draw columns) if one has $1000 at (end of age 64 or) start of age 65, then one can draw $30 for the year while the remaining $970 is invested at 0.6% real for the year, resulting in $976 at end of the year). Each (subsequent) year you repeat this procedure with updated then current: real risk-free rates, number of remaining payments (from Table 1) and assets available for annuitization (or investment). Or just enter the current average real risk-free rate into the spreadsheet and use the (pink column) percentage and multiply by your current investable assets to calculate maximum draw. The maximum permissible draw should not necessarily be drawn if not required to meet consumption needs beyond those that are covered by existing pensions and/or other income. -in their earlier paper referred to above (Sexauer and Siegel), they use longevity insurance bought at age 65 to provide post age 85 income stream for remaining life. Here they use a reasonably conservative average of life expectancy and remaining lifespan as an estimate for number of years that an income will be required. This number of years calculation also helps recognize that “an investor puts a premium on income received in the early part of retirement, when she is likely to travel and have other expensive consumption goals”, yet protects assets should one live unusually long. – The authors further note that smoothing or reaching for more risk than tolerable (as used by DB pension plans to try to increase returns) doesn’t work any better for individuals either, so don’t bother with these. -The authors look at some other ways to manage longevity risk, but their concerns with annuities are particularly instructive: (1) complete annuitization eliminates all liquidity and leaves nothing for emergencies, (2) you lose control on investment choices and insurer uses very conservative assumptions (i.e. expensive approach for you), (3) “hard to figure out of you are getting a fairly priced deal, so you are probably not”, and (4) annuity contract is subject to counterparty risk, the possibility that the insurance company won’t pay” at all. – Table 1 shows how Age, Life Expectancy, remaining Lifespan (assuming maximum 120-age), years of income required using average of life expectancy and lifespan, can be used to calculate maximum that can be drawn at each age year for the given real return. You can access the spreadsheet and then enter real risk-free rate if different than indicated to calculate the maximum % draw for each age at the current real risk-free rate (0.6%). 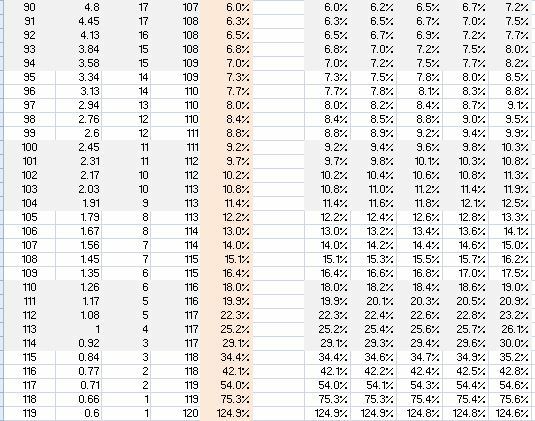 Now let’s see how we can use the max % draw, from Table 1 under PinkFemale column for the appropriate age, in the YellowBox part of the spreadsheet where individualized data is entered (e.g. age, assets, spending requirements, tax rate, pensions and maximum assumed stock market drop) to calculate maximum % and $ draw in current year and explore portfolio/income risk as well as maximum stock allocation for some assumed maximum stock market drop, to still be able to cover the specified fixed and discretionary expenses. The Yellow Box portion of the spreadsheet allows you use your age, the value of your assets, fixed and discretionary expenses, average tax rate and your assumed “worst case” stock market drop to estimate you maximum stock allocation for the coming year without jeopardizing income coverage for your fixed, and discretionary expenses. 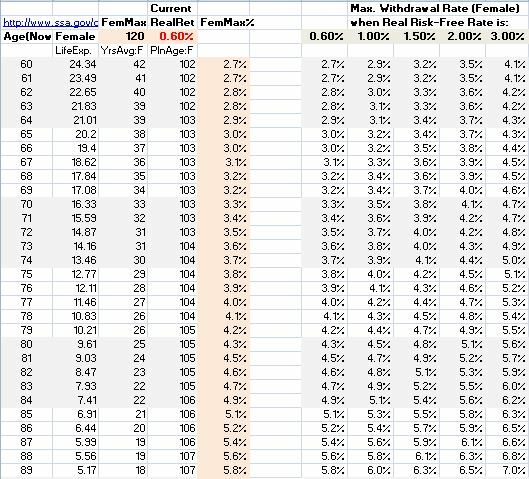 Note that the age is used to (automatically) extract the maximum percent draw from the Female Maximum % (pink) column in the spreadsheet using the specified Current Real Return (0.6% here). The ‘age’ you specify (65 here) is used point to the corresponding withdrawal rate (3.0% here). Note that in the blue part of the spreadsheet you can also specify the assumed inflation expectation (2.5% here) which is only used for the example given in this blue part of the spreadsheet specifically for a 65 year old and is not applicable to Nominal Assets or Draw at any other age. It is also interesting to note in this blue part of the spreadsheet, that this strategy is sufficiently conservative for this 65 year old that at age 89 using risk free portfolio, the real assets are still at about 40% and real draw at about 83% of starting level; and in nominal terms assets are at 73% and draw at 150% of original level. Nice review Peter! I really like the strategies described in this paper. Makes sense and not that difficult to calculate. I think it’s an important result, but a little opaque in that is revolves around the black-box PMT() function in Excel, and the formula behind that is not overly transparent either for the average user. Spending = Assets * ( 1/yrs + 0.5*r). which for r<5%, yrs<35 is accurate to with about 5% which is probably a wide enough range and sufficiently high accuracy for this sort of calculation. At least you can get a feel for the role of "yrs" vs "r". More details can be found at J of Personal Finance, September 2014. "A rule of thumb approximation for time-value of money problems".